The Iraeli occupation army on Friday morning carried out a small-scale incursion into Khuza’a town, east of Khan Younis city in the Gaza Strip. Local sources told the Palestinian information center (PIC) that Israeli bulldozers, backed by armored vehicles advanced under aerial cover into the east of Khuza’a district amid intensive firing of smoke grenades to conceal the incursion. 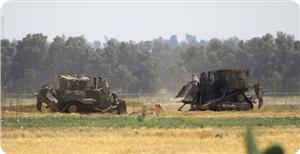 Several areas were bulldozed during the operation, while a number of military jeeps and tanks stationed behind soil mounds along the border fence so as to protect the invading troops, according to the sources. At least two Palestinians were kidnapped on Friday, at dawn [May 9, 2014], and several residents have been detained and interrogated, as the army invaded various Palestinian communities in the occupied West Bank. Several Israeli military vehicles invaded Azzoun town, east of the northern West Bank city of Qalqilia, where soldiers kidnapped two Palestinians. Local sources said the soldiers kidnapped Odai Samir Abu Haniyya, 24, and Omar Jamal Salim, 20, after breaking into their homes and searching them. Last night, soldiers detained two children, identified as Ala’ Hussein, 14, and Shadi Suleiman, 15, in Qalqilia, and released them several hours later. On Friday morning, several Palestinians suffered the effects of tear gas inhalation, after Israeli soldiers invaded Borqeen village, south of Jenin, and clashed with local youth. The Palestinian News & Info Agency (WAFA) said the army fired several rounds of live ammunition, rubber-coated metal bullets and gas bombs directly after invading the village, leading to clashes with local youth who threw stones at them. 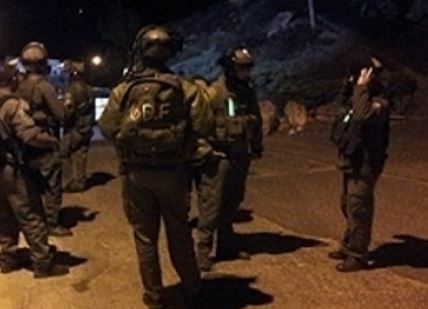 In related news, soldiers invaded Beit Fajjar town, south of Bethlehem, especially the al-Fajr School Street, and searched several homes after forcing the residents out. WAFA said the soldiers forced several families out of their homes, and kept them in the cold and under the rain, while searching and ransacking their property. On Thursday at night, the army said it arrested three Palestinians allegedly carrying Molotov cocktails, south of the West Bank city of Bethlehem. The army claimed the Palestinians intended to attack settlers’ cars driving on a nearby settlement road. The three were moved to an interrogation facility. 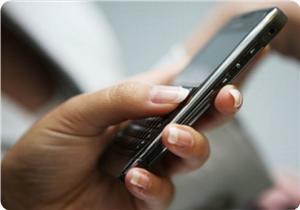 Several Gazan young men received text message on their cellphones on Thursday evening asking them frankly to work as informers for Israel. One of those young men told the Palestinian information center (PIC) that he was extremely shocked when he received a text message asking him to keep in touch with someone called Captain Adnan. Another young man said he did not even tried to know out of curiosity what further the senders wanted because they were for sure from the Mossad or the Shin Bet. The calls come at a time when poverty and unemployment rates in the Gaza Strip have been hitting the record, especially among the youth, of which IOA have taken advantage to force Palestinians to work as spying agents, a security official told the PIC. The security official called on all young people not to deal with such suspicious messages or any attempt by the Israeli occupation to recruit them as spies against their own people. 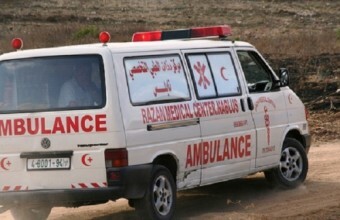 The Israeli forces stationed along the border with southern Gaza Strip have shot and injured a Palestinian in the Deir al-Balah town. The spokesperson of the Ministry of Health, Ashraf al-Qidra, said in a statement on his facebook page that a Palestinian youth, with the age of 27, was shot in his right foot, and admitted to hospital. Qidra reported the injury as moderate; he did not identify the name of the injured, nor the circumstances of the incident. Since the Israel-Hamas ceasefire agreement which followed an eight-day deadly ‘Pillar of Defense’ aggression, Israel has not been committed to its provisions including ending of all hostilities, and facilitating of the freedom of movement and the transfer of goods to Gaza. Clashes erupted between dozens of Palestinian youths and Israeli occupation forces (IOF) in Safa village near Beit Ummar town northern al-Khalil, while IOF checkpoints were set up in different areas throughout the province. Eyewitnesses told PIC reporter that Israeli forces stormed Safa town on Tuesday evening and started firing tear gas canisters and metal bullets at Palestinian homes which led to the outbreak of violent clashes. Injuries among civilians were reported during the clashes, the sources said, adding that young men threw stones and empty bottles at the invading forces and settlers, who arrived in the company of the IOF soldiers. The sources pointed out that IOF soldiers repeatedly raid the area in conjunction with settlers' attacks and violations in the area. In a related context, Israeli forces have erected on Wednesday morning military checkpoints and tightened their security restrictions in different parts of the province. 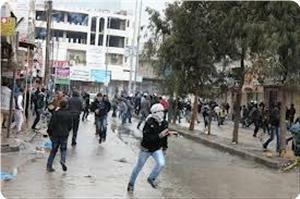 Eyewitnesses said that Israeli soldiers were deployed in different areas of al-Khalil. Palestinian vehicles passing by were stopped and searched by Israeli forces at the main streets in al-Khalil under the pretext of looking for wanted persons. 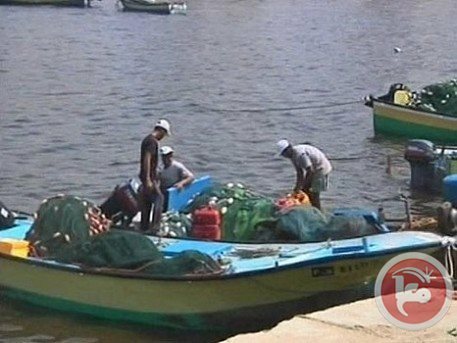 Two Palestinian fishermen were injured late Tuesday when fishing boats collided after being fired upon by Israeli warships off the coast of Gaza City, witnesses said. Witnesses told Ma'an that fishermen -- members of the al-Bakr family -- were taken to al-Shifa hospital for treatment and the boats were seriously damaged. In the Oslo Accords, Israel agreed to a 20-nautical-mile fishing zone off Gaza's coast but has imposed a three-mile limit for several years, opening fire at fishermen who strayed further. 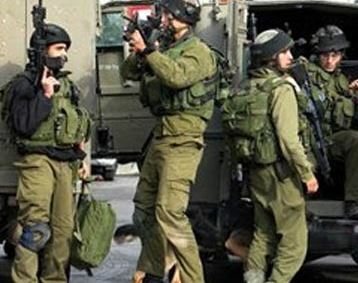 Israeli soldiers kidnapped four Palestinians, including a child, from the northern West Bank district of Jenin, and took them to unknown destinations. Local sources said the soldiers kidnapped Monir Ali Jaradat, 16 years of age, in an olive orchard in Marj Iben ‘Amer Meadow area, near the northern West Bank city of Jenin. Jaradat is from the Sielet al-Harethiyya town, near the Meadow area. The Palestinian News & Info Agency (WAFA) has reported that the army also shot and injured Mohammad Nasser Kamil, 25, as he was working in Arrabat Al-Batouf town, in the Galilee, and kidnapped him. Another Palestinian, identified as Morad Mahmoud Kamil, 24, was also kidnapped in the same area. In related news, soldiers invaded Qabatia town, near Jenin, broke into one home, and violently searched it, before kidnapping one Palestinian identified as Saleh Amin Kamil, 42. Earlier on Tuesday, soldiers invaded various districts in the occupied West Bank, broke into and searched homes, and kidnapped several Palestinians. Two children were also injured, in two separate attacks, carried out by Israeli soldiers in Hebron city, in the southern part of the occupied West Bank. 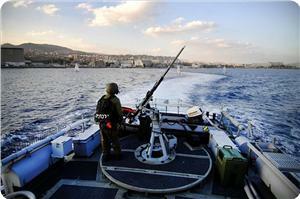 Israeli navy targeted on Tuesday morning Palestinian fishing boats off the coast of north-western Gaza Strip. Israeli gunboat opened fire at Palestinian fishing boats sailing within about six nautical miles off al-Sudaniyah area, north of Gaza City, which led to excessive material damage. Israeli naval forces deliberately target Palestinian fishing boats and prevent them from fishing in the allowed area of six nautical miles. Fifteen Palestinians were injured, and three were detained in the Old City of Jerusalem on Monday, medics said. Medic Iyad Abu Sneineh said 15 people were injured in the clashes, including five who were taken to hospital for treatment. 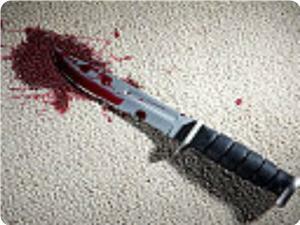 Among the injured was a man shot in the chest with a rubber-coated steel bullet, and an elderly woman hit in the foot with a stun grenade. 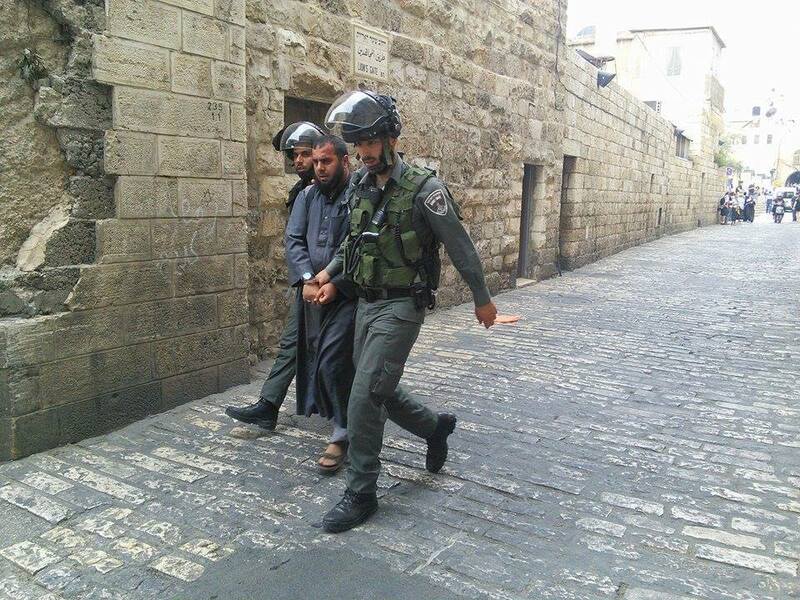 Israeli forces also beat and arrested three people in the same area. The arrested were identified as the imam of al-Bahr mosque in Jaffa Mohammad Ayesh, Salih Sweiti, 22, and Hussam Seder. A Ma’an reporter said that clashes started when Israeli forces suddenly attacked worshippers who were prevented from entering the al-Aqsa compound with stun grenades and rubber-coated steel bullets. Female worshippers threw empty water bottles and shoes at the deployed forces. Israel might battle Palestinian fighters in the Gaza Strip and Hezbollah in Lebanon, Israeli Chief of Staff Benny Gantz said today. Gantz visited training camps in the north of the occupied West Bank. He said the deadline for peace talks came to an end on April 29 and the Israeli army is now training to be ready to face challenges on all fronts; southern (Gaza), northern (Lebanon) and the West Bank. "Palestinians will not remain silent forever," he said, noting that the Israeli army is developing its capabilities in all fields. When asked about political issues, he refused to answer saying that it is the role of politicians to answer such questions. He said that he was expressing his worries as a military leader. In a report broadcast on Israeli TV's Channel 2 Gantz said that the world around Israel had changed. He said that Israel was preparing to face the Syrian army, but now they are preparing themselves to face armed groups. He candidly expressed Israel's worries regarding Hamas and Islamic Jihad in Gaza. "We are monitoring them closely," he said, "and we do not rule out a massive confrontation with them in the future." Gantz said Hezbollah's rockets can reach all Israeli cities; therefore, his army is developing its capabilities to face this challenge. 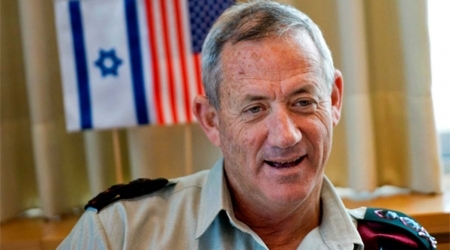 There is no reason for the Israeli army to carry out unilateral military operations in Sinai because Tel Aviv maintains good relations with Cairo, Gantz explained. He reiterated that there is continuous contact between the Israeli and Egyptian armies. Two Palestinian children were wounded after being attacked by the Israeli occupation soldiers in the West Bank city of Hebron. 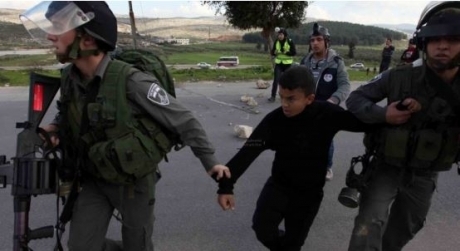 Local sources reported Israeli soldiers violently abused and beat child Khaled Zahda,12, at Bab al-Zawyia . The child sustained bruises in different parts of his body and was transferred to Hebron Governmental Hospital for treatment, they added. 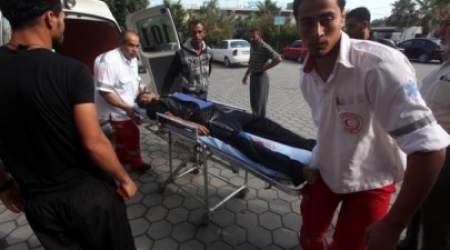 The attack happened after clashes broke out between Palestinian youths and Israeli soldiers. In the same context, Palestinian minor Feras Dwaik was injured in his head after a group of Israeli soldiers threw stones against him near the Ibrahimi mosque. Israeli soldiers invaded several Palestinian communities in the occupied West Bank, installed roadblocks, and searched several homes after violently breaking into them. Local sources in Ya’bad village, near the northern West Bank city of Jenin, have reported that dozens of soldiers invaded the village, and searched at least one home, before invading the area of the Homesh former Israeli settlement, and searched it. The sources said the soldiers invaded the vacant home of a resident identified as Mo’ab Hasan Qneiry, causing property damage. Soldiers also invaded Taqroumia town, west of the southern West Bank city of Hebron, and searched a home that belongs to resident Yasser Hasan Fatafta, 30, also causing property damage, and interrogated several Palestinians. In addition, several military vehicles invaded various neighborhoods in Hebron city, and several nearby villages and towns, south of the city, and searched a number of homes; no arrests were reported. Dozens of soldiers also invaded various communities in the West Bank city of Bethlehem, mainly the Obeyyat area and Khalayel al-Louz. The army also installed a roadblock in the Sharaf area, between al-Khader and Batteer towns, west of Bethlehem, stopped dozens of cars causing traffic jam and extended delays. On Monday evening, soldiers ordered resident Hasan Mohammad Salah, 67, to demolish his well, in his own land south of al-Khader. The well is close to the Eliezer illegal Israeli settlement; Salah has 35 days to appeal the decision or demolish his well. Also on Monday evening, soldiers stationed at the Za’tara military roadblock, near the northern West Bank city of Jenin, kidnapped one Palestinian while trying to cross. Eyewitnesses said the army kidnapped Ata Sheikh Ibrahim, 26, from Kufur Ra’ey village, near Jenin, and took him to an unknown destination.